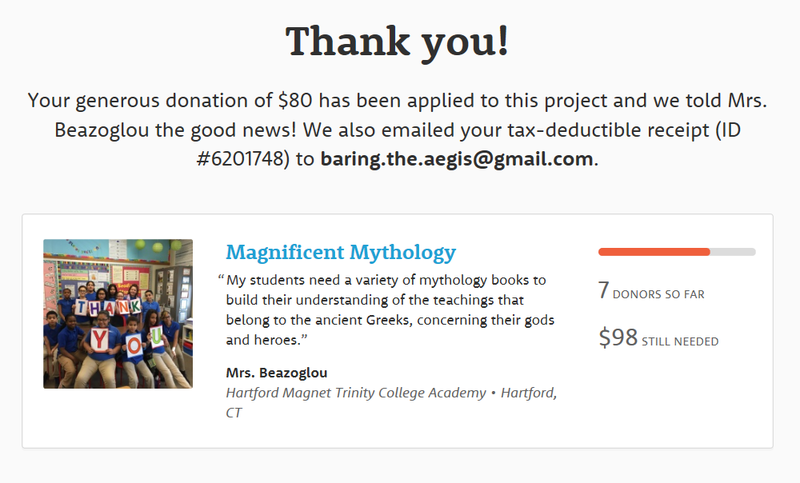 We are proud to announce that Pandora's Kharis members have come through for Mrs. Beazoglou's Magnificent Mythology. Together, they have raised $ 80,- to help support this very worthy cause. Thank you very much! Mrs. Beazoglou is a teacher at the Hartford Magnet Trinity College Academy in Hartford, CT, USA. This year her students will be reading the "The Lightning Thief." This fantasy-adventure based novel is based on Hellenic mythology. Unfortunately, her students come to school with little background or understanding about Hellenic myths. Beazoglou's goal is to build a classroom library of mythology books for her students to access after she teaches a concept or gives a book talk to learn more about a particular God or myth. It will also allow her students to make connections from "The Lightning Thief" to the old Hellenic myths. The students will get reading instruction through a literature circle model. This model is a book club where each student is given a role to be an expert on the assigned chapter. Students will then meet as a group to discuss their findings and dive deeper into the message or theme of each book.The project is for grade 6-8 students. More than half of them come from low-income households. From this moment on, the Pandora's Kharis Facebook page is open to pitches. If you do not have Facebook, feel free to pitch your cause in the comments. We will relay the message to the community. Please pitch your cause before September 1st. On to another month of pitching, voting, and giving!